It is a great honour for us to invite you on behalf of the sons of Jaromir Vejvoda, the world-known composer of wind music and the author of the most famous polka of the world “Skoda lasky” (Beer Barrel Polka) to the 24th anniversary year of the festival "Vejvoda´s Zbraslav". The festival is held under the auspices of the City of Prague. The festival will take place in the birthplace of Jaromir Vejvoda - in Zbraslav (part of Prague) from 27th to 29th September 2019. The accredited organiser of the festival is the Organisational and Festival Agency OR-FEA Prague in cooperation with Zbraslav Council. The festival is opened for wind orchestras, big bands and jazz ensembles without any limits. Orchestras with majorette groups are welcome. 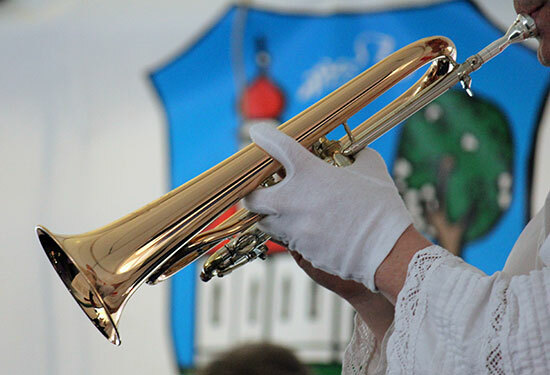 As a part of the festival there is a competition, which is open for small wind bands with up to 25 players. Outside the contest and at other concerts except the contest performance more players than 25 can participate. There is a compulsory composition for the competition. The competition will be evaluated by three members of a professional jury appraising the interpretation of the compulsory composition. Each of the participating orchestras will receive a participation certificate. The order of the competition will be set by the organisers. 28th September (Saturday) from 9,00 a.m. the competition of participating orchestras will be held in Zbraslav theatre. After the end of the competition the orchestras will introduce their own programme in the festive tent on Zbraslav Square. From 3.00 p.m. a festive parade through Zbraslav will be prepared. The top point of the festival will be a concert of Vejvoda´s band in the tent on Zbraslav Square at 5,00 p.m. The announcement of results of the competition and a common concert of all participating orchestras under conducting of Josef Vejvoda, in which the compulsory compositions of the individual categories and other compositions of Jaromir Vejvoda will be played, will take place within the framework of Vejvoda’s band’s concert. At 6,00 p.m. the representatives of the orchestras will be received by the mayor of Zbraslav. From 7,00 p.m. all participants will be kindly invited to folk dance with a Czech band and another programme to the festive tent on Zbraslav Square. 29th September (Sunday) at 10,00 a.m. a matinee in the tent in Zbraslav, for those orchestras which are interested in the performance, will take place. In addition to this we would like to invite you to see our golden city Prague with all its monuments, restaurants and sights.